Prominent Christian leaders criticized Sen. Rand Paul (R., Ky.) on Friday for comments he made about the role the Christian community plays in America’s foreign policy debates. "I think some within the Christian community are such great defenders of the promised land and the chosen people that they think war is always the answer, maybe even preemptive war," Paul said in an interview with BuzzFeed. "And I think it’s hard to square the idea of a preemptive war and, to me, that over eagerness [to go to] war, with Christianity." Paul’s comments appeared to be aimed at the Christians United for Israel (CUFI), a prominent pro-Israel Evangelical group that has advocated in favor of strong U.S.-Israel ties. The senator’s office was forced to clarify his comments after officials at CUFI and other pro-Israel insiders repudiated the remarks, calling them "slander." 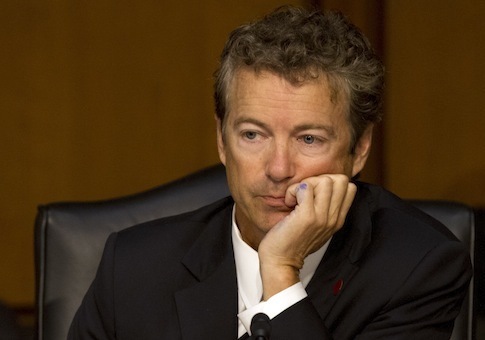 "Sen. Paul has always enjoyed a good relationship with CUFI," Paul adviser Doug Stafford told BuzzFeed. "As the quote says, he noted that ‘some’ in the Christian community have seemed too ready to go to war. Sen. Paul did not say ‘all,’ or even ‘most.’ He was not speaking of any group as a whole, which should be clear to anyone who re-reads what he said." CUFI executive director David Brog told the Washington Free Beacon that while he appreciated Paul’s aide’s explanation, the senator’s assertion was mistaken. "I appreciate Sen. Paul's clarification that he was not speaking about CUFI when he made these remarks," Brog said. "And I very much agree with Sen. Paul that America has shed too much blood and wasted too much treasure fighting wars that have not furthered our national interests. "But I must disagree with the assertion that these wars were somehow linked to Israel," Brog said. "Israel did not want the war with Iraq, and it certainly did not ask for it. And Israel remains the only nation in the world which is fighting America's enemies on America's behalf so that our sons and daughters don't have to." Paul aide Stafford told the Free Beacon that the senator would continue to discuss the issue of Israel with CUFI. "We appreciate that CUFI has acknowledged our clarification," said Stafford. "Sen. Paul has spoken out many times on the importance of our relationship with our ally Israel, and his commitment to Israel's defense. He remains committed to this and looks forward to a continued conversation about how to craft a foreign policy that recognizes that relationship, while becoming more restrained in our use of force, more vigilant in our defense of our rights, and more dedicated to constitutional separation of power." Prominent Christian leader Gary Bauer said that Paul should focus on more pressing foreign policy issues if he expects to be taken seriously. "Sen. Paul should not lose sleep over mythical Christians who he imagines always want war," said Bauer, a former Reagan administration official who serves as president of American Values, a leading Christian group. "His time would be better spent telling us how he would stop the Iranian mullahs who are on the brink of producing nuclear weapons while they threaten the destruction of America and Israel," Bauer said. "If the senator wants to run for president in 2016 he probably should try harder to not sound so much like Barack Obama," he said. One former official with the American Israel Public Affairs Committee (AIPAC), the nation’s most prominent pro-Israel group, said he thought it was clear Paul was criticizing CUFI and its supporters. "If he wasn’t talking about CUFI, who possibly could he have been referring to?" asked the former AIPAC official. "I’ve never heard of any Israel’s evangelical supporters argue for preemptive war. The Israelis fight their own fights and Israel’s allies know it." The source added that Paul "would be wise to stay clear of making broad generalizations." Paul was perpetuating false conspiracy theories, one CUFI official told BuzzFeed. "While we’re debunking ugly myths, let’s also be clear that the United States did not go to war in Iraq or Afghanistan for Israel," the source was quoted as saying. "No one familiar with the debates over these wars can seriously suggest otherwise." This entry was posted in National Security and tagged Congress, Rand Paul. Bookmark the permalink.